Last year I blogged about Bonfire Night or Guy Fawkes Night as it’s also called. Although the tradition of Guy Fawkes stems from an historical political event, it’s lighting up the darkness, so to speak, and so fits right in with a number of autumn time traditions, some originating hundreds of years ago. There are men who carry flaming barrels of tar through a Devon village; folk who pour cider over apple tree roots and cross-dressing troupes who perform something called Soul Caking to ward off evil spirits. Souling is a centuries-old tradition in Cheshire where actors known as ‘mummers’ perform a play for All Souls Eve on 1 November. The tradition of Souling was intended to protect communities against outsiders and dark spirits. Souling plays were fairly widespread until the 19th Century. The most famous ones performed nowadays are at Antrobus, Comberbach and Warburton. The tradition is also known as soul caking – due to mummers traditionally handing out confectionery known as ‘soul cakes’ to the audience at the end of the play. In an example of how tradition piles upon tradition, this is itself believed to be based on the even older medieval practice of handing out cakes to beggars in remembrance of the dead. The Ottery St Mary Tar Barrel Festival, in Devon, on 5 November is also believed to have started after the Gunpowder Plot. The tradition sees competitors – who have to have been born in the town – running with burning barrels on their backs until the heat becomes too unbearable or the barrel breaks down. However, this is one tradition in danger of being snuffed out, because of increasing public liability insurance costs. At last year’s event, 16 people suffered minor burns. Refer to my notes on water later on in this blog. Then there’s Punkie Night, only celebrated in Hinton St George, Somerset, which has traditions of pumpkin carving and night-time walks that are remarkably similar to the Halloween rituals we all know. 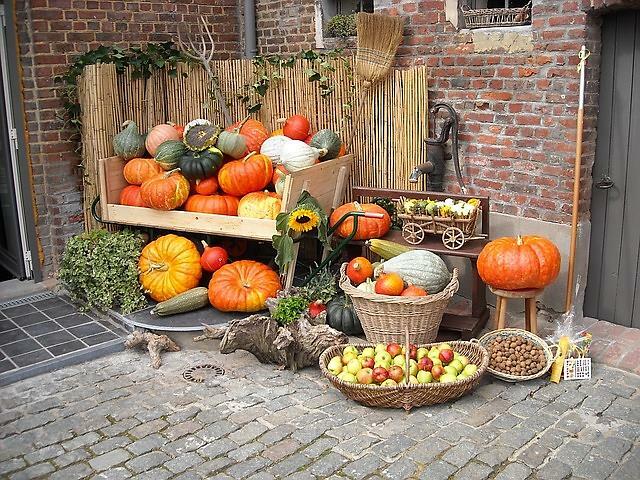 The village’s Punkie Night takes place on the last Thursday in October. Children carry ‘punkies’ – lanterns traditionally made from a large turnip known as a mangel-wurzel – and stop at key locations to sing the Punkie Song. Far from courting the dead, like Halloween, the tradition allegedly stemmed from a bunch of inebriated villagers. “The men folk of the village went to Chiselborough Fair about four miles away and they had too much to drink,” says local historian Charles Bird. On the whole however, English autumn traditions are concerned with marking the end of the harvest and respecting the dead. To pour over yourself in case you catch alight. Right, off you go then, make merry and enjoy the Autumn festivities!